There’s glamour, too: Nine Hollywood studios are sending teams. If you like to follow the lives of Hollywood’s famous figures, Malibu is their Xanadu. Some even participate in the tri. So popular is the event that the “classic distance” triathlon on Sunday sold out to 3,200 athletes in three hours. The newcomer learns a triathlon can be expensive. There are road bicycles priced from $1,000 to $5,000, made of aluminum or carbon fiber. There are also special shoes to clip onto the pedals, plus speedometers and even GPS accessories. Me, I’ll be the old-school guy on race day. I won’t be on a road bike. Rather, I’ll be churning my Schwinn mountain bike – a tank compared to the lightweight modern bikes, which zip by me like Porsches during our training on the 18 miles of hilly coastline that will be the race course on game day. No matter. This throwback bike, a modern gift from my father 20 years ago, gives my effort meaning. It also gave my teammates an opportunity for humor. “Going camping, Mike?” the team coach playfully joked, referring to a cylindrical saddle pouch beneath my seat that could hold an elf’s sleeping bag. I rudely entered the 21st Century as the only guy with a kickstand during an initial practice pedaling the mountainsides of Pasadena near the Rose Bowl. The kickstand was removed by the next meet. Even my bike helmet seems ancient, worthy of Vikings. The black headgear is shaped like a Capitol dome. Its antiquity is proved by a manufacturing sticker of “April 1991” inside it. Today’s helmets are colorful works of art, resembling windswept flames. I won’t buy a new helmet. But I did give in on the bike bag, purchasing something less pastoral and more sporty for $15. 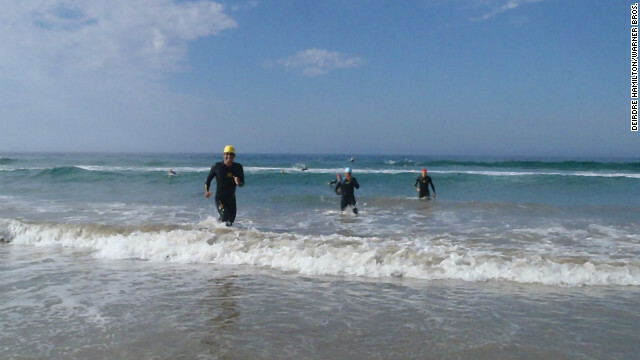 Of the race’s three legs, the ocean swim is the most daunting and satisfying. The monotony of strokes is meditative, and the metronome turning of the head for gulps of air is rewarded with a vista of the high chaparral of the Santa Monica mountains. The open water imposes two tests of strength: getting past the surf - after which some swimmers take their first rest - and then the long haul stroking through the swells. Don’t mind the vertigo. We members of the Warner Brothers/CNN team (both companies are owned by Time Warner) trained for the ocean swim every Tuesday night after work, under the palm trees at the outdoor 50-meter McCambridge Pool in Burbank, California. We also prepared for the triathlon’s foot race the same night at the Burbank High School track, as elementary and high school students used the infield for football practice. As demanding as the conditioning is, it’s rewarded by immersion in the great outdoors. Burbank High is at the foot of the Verdugo Mountains, and the sunsets sent shadows dancing across the canyons and summits. But the biggest panorama of nature doesn’t come easy - the 18-mile cycling course on a ribbon of asphalt between the Santa Monicas and the ocean called the Pacific Coast Highway. Heavy breathing is common along the steep hills, but the exertion elevates cyclists to commanding views of the foamy shore, rocky ravines, and tony manses of Hollywood’s elite. As scenic as the activity is, one still wonders why anyone would awaken at dawn to exercise three hours on what is supposed to be a biblical day of rest. To get it over with early. As race day approaches, team coach Mary Kane reminds new and veteran triathletes alike of a slogan that is useful for any great endeavor: You are a winner every time you get to the start line. If you're using a helmet that old it's useless. They degrade over time. $50 is cheap insurance for your head. Thanks for the advice, Steve. Glad I wrote this story. I whole-heartedly agree with Michael M.'s helmet comments. The age of your helmet jumped out at me when I read your column. Your helmet is too old, but I am really glad to hear you are riding your old Schwinn – I think that's great. Good luck Michael and have a fun race! I placed in my age group at the Copperman Triathlon (beautiful triathlon set up in Copper Harbor, MI at the tip of the Keewenaw Peninsula) on a mountain bike. I've since bought a decent road bike but I'd take my mtn. bike anyday. Bothers me that people just buy their speed depending on how much money they want to spend on a bike. I hear ya about "buying" time, Cheryl. What price time? Well, about $2k to $5k if you want to shave 30 to 45 mins off your course time. I wouldn't mind an inexpensive road bike, though. Say, I've been to the Yoop many times, though on the far side from you, in Menominee. Great sailing on Great Bay. Good luck, but please don't promote the use of old helmets as already pointed out. All of the literature indicates they are not reliable after a few years. Even a slow speed spill can lead to permanant and severe brain damage. Takes a special person to read - and post comments! Thanks, Russell. Good advice. Ok, so why is having a kickstand on a mountain bike rude? It's not rude. "serious" bikers don't have them on their bikes. Anything on your bike has to be carried up the hill with you. a kick stand is considered wasted weight. Bike culture can also be very image oriented. They might tease you for having reflectors on your wheels, getting a grease stain on your leg ( called cat 5 tattoo), or having bells on your bike. You also have the hipsters who have their own set of rules. A kick stand would probably be okay in their culture so long as it's not actually used as a kickstand and is placed in the wrong location on the bike. I learned a long time ago that it's nearly impossible to not look silly on a bike no matter what you do, so you might as well just do what you like. Roger that =-) Thanks! I was trying to figure out what kind of problems your kickstand could cause someone else that would make it rude. I recently crashed hard during the Espirit Ironman in Montreal. Luckily a day before the race I bought a new helmet. i've still got a concussion but I believe that helmet may have saved my life. Upgrading to a new helmet is a very good idea! I've been going "old school" for years, it's called being poor. I didn't know I was so trendy. I've been laughed at, ridiculed, and asked if I "was in the right race." for years by the snobby elitists who think they own the race. I took great satisfaction in passing most of them going up hill on the mountain bike (from Costco) that I got as a beach cruiser 15 years ago. And my t-shirt? No sponsors, no fake team jersey, no wanna-be italian, I think it was just white. I wanna ride with you, Advizor! Michael – great article and I appreciate your honesty as you have ventured into the world of cycling. Admittedly, we cyclists can be a bit pretentious, but if you really enjoy tris and enjoy the cycling aspect, I highly recommend saving up for a decent carbon bike. You don't need spend $5,000 (sadly, that "high-end" figure is grossly understated as many tri bikes run north of 5k and come closer to the 10k mark), but if you know your size you can find a gently used carbon bike for $1500, and even entry-level new ones for less than 2k. Not cheap, but well worth it when you can fit in 60 miles in three hours 9and be comfortable), versus the same mileage in four hours on a MTB. Best of luck in your first tri – i suppose the only place better to do it would be Hawaii – but maybe your next series will be about your first iron man! Thanks, CJ. Now to figure out what size I would need - I was surprised to learn that it's no longer one figure to determine size. Length is now also factored in. You'd be surprised what you can get for $1600 in a carbon bike. Just invested in one last year and did my first 100-miles in Door County last weekend. Hi, Jill: Was just in Door last month - and rented a bike in Fish Creek and biked from Sister Bay to Lake Michigan side of the peninsula. Nice. Say, do carbon bikes wear out faster because of the carbon construction?